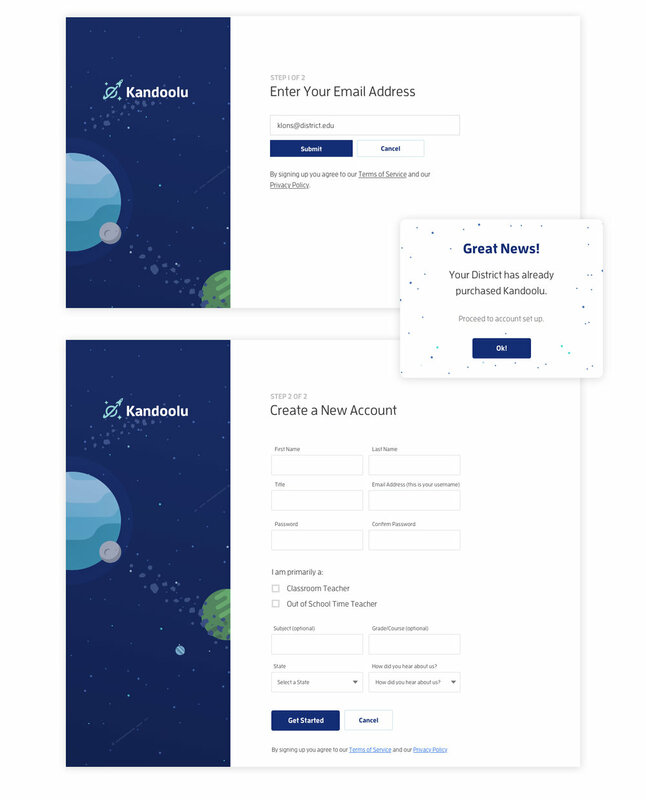 Kandoolu is a personalized, real-time assessment tool to assist teachers with classroom instruction. 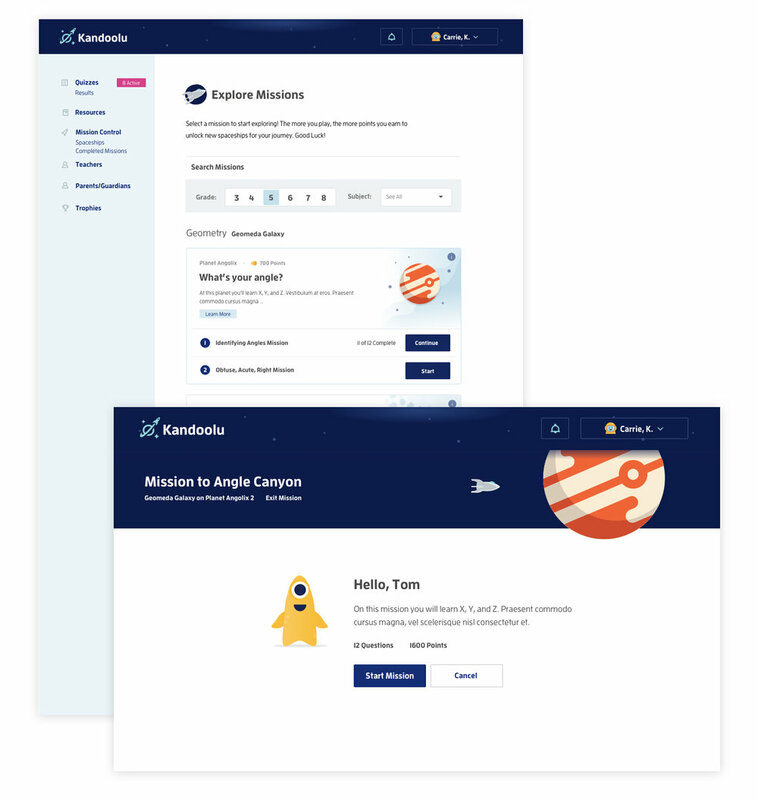 Recently, OnHand Schools (OHS) contacted me and my colleague, Elaine, to design a new feature for the app they called “Mission Control.” This feature would make Kandoolu available to out-of-school tutors and give students an intuitive and gamified practice room for math. To develop a Mission Control prototype, OHS received a grant from the Heinz Foundation. Our goals were to streamline the original proposed workflow, cut unnecessary clutter, and align the feature to the pre-established conventions in the app so users could adopt it quickly. For student users, our challenge was to get them into missions with as few steps as possible and make it easy and fun for them to use. We were mindful about making missions feel distinct from quizzes, so they felt more like practice, and less like assessment. We were able to reduce the number of steps from six to two, and added the game-like element of making new spaceships a reward students would earn by completing more missions. Like other content in the app, missions also had to relate to Common Core Standards. While the specifics of each standard were important for teachers, they were not important for students and were “hidden” as plain language. The design also needed to be flexible to work with a small amount of content at first, but grow and adapt to significantly more content added in the future. Students could start, continue, or review completed missions. A mission could also be self directed or assigned by a tutor/teacher. One issue we needed to address early was how tutors’ and teachers’ experiences might be different and how we would accommodate this new user type into the app. This problem would affect multiple areas, including account creation, linking codes, and functionality the tutors would be allowed to access. At first, it seemed necessary to develop separate workflows for a tutor and teacher to assign missions to students. After detailing and exploring different use cases, we decided there was not enough justification to create two unique workflows. Doing so would add to the complexity and scope of the project, without the promise of a truly better experience for either user. However, some additional user research would help uncover ways tutors might use the app that would be different from teachers. During the exploration of user types, we were able to streamline the login and sign up process for users. Teachers or tutors can now see if their district has already purchased the app after they enter their email address, and self-identify as a tutor or teacher. Creating a more simplified stepped process will help reduce cognitive load and get users signed up in less time.